January, and all is… well, it’s January. « You know… that Blog? January, and all is… well, it’s January. Yes, I know it’s been a long time. Yes, yes, I’m sorry about that. I just fizzled out, and the last few months have been rough. Yes, I’m ok, thanks for asking. No, really, I’m fine, it’s just been a non-blogworthy few months is all. So how have you been? It’s been quiet in Blogosphere from what I’ve been seeing. 2013 was not a great year. Nothing really horrific, just… meh. The holidays were quiet, and for the first time we didn’t host a single party, or entertain even once. In fact, the tree and all decorations (that weren’t encased in snow and ice outside, to be dealt with during the next thaw!) were down and safely packed away by December 27th. We just didn’t feel it this year. I’m not into the presents anymore. Christmas has morphed from special and magical to just expensive and stressful. It probably wouldn’t have been so had we actually thrown a party or two and socialized, but schedules just didn’t work out with friends this year – everyone was thrown into the same chaotic loop and crossing schedules. We got together for a really great evening with friends shortly after Christmas, which was really nice, and for the first time in a LONG time we went out on New Year’s Eve and partied into the wee hours! Yeah, about that… I have no idea why I brought it, but my iPad came along for NYE celebrations. We were planning to sing, and with my Fibro-brain, some of our newer songs just aren’t sticking, so I tend to drag the trusty song-carrying iPad along with me wherever I go. The weather was really lousy, and as I had a job just keeping on my feet in heels as we left our friends’ place to get to our car, I had the Hubby carrying the iPad. We were driving, and he knew he had to clear out the back seat a little (wee one sets up camp in the back seat, so her stuff was everywhere). So… he put my iPad on the roof and got to clearing her things out and throwing it all into the trunk. I’m sure you can tell where this is going. His face went instantly white. He knew in that split second what he’d done. He was out the door in a flash, and back a few minutes later to tell me that it wasn’t there, and that he’d left it on the roof of the car. He said he was going to go look for it, and he left to retrace our steps. Keep in mind that it was a lengthy drive to get where we were, so I didn’t hold out much hope that he’d find it. I got on my phone and logged into icloud.com and marked the iPad as lost, and put in a message with my phone number that would pop up on it the next time it tried to connect to the internet, in case someone found it and was decent enough to call. It also would allow me to track where it was, which is really a nifty feature (Thanks, Apple!). About half an hour later though, Hubby called to tell me he actually found it! On a busy road near a gas station. And it had been run over many, many times. So… ok, I had closure at least, it wasn’t still out there, with people trying to crack it and get to my stuff (which was really just music and a few games, no security issues there). I asked him to put it somewhere so I wouldn’t see it until later, and then he came back (got the same parking spot! I guess people don’t like to parallel park?) and we concentrated on having a good time with friends. It was a good time. Sure, it clouded my evening, but I tried to get past it, anyway. I figured it happened in 2013, and 2014 is a fresh, new year, so things will be looking up from here on! We got home around 3am (*Yawn*) and were upstairs getting settled in when an alarm went off downstairs. 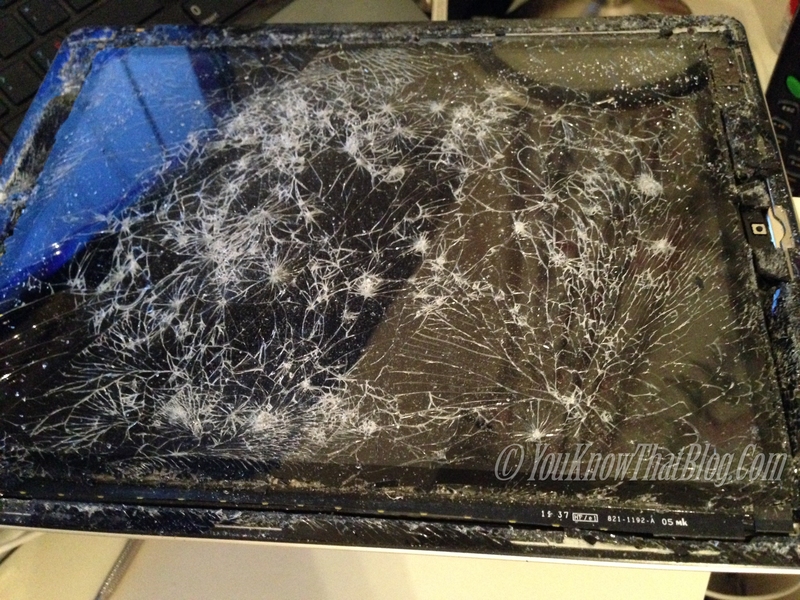 I shot down the stairs, and it was the iPad! “You’re KIDDING me.” I hadn’t seen it yet, but there it was on the hall table, yelling for attention. I opened up the leather case, and the message I had put up on icloud.com was staring up at me! Well, I am pretty sure that’s what it was, because the entire glass screen was shattered. Still, it was clearly still alive! I took it upstairs and plugged it in to my computer, and it actually connected to iTunes! I got all of the pictures and video downloaded, and was able to see the interaction in iTunes – so maybe maybe it can be saved, and we’ll just have to replace the screen! I’ll be taking it in some time this week when I get a chance. I think maybe the leather case I bought (and spent way too much on! Hey, maybe not, eh?) may have saved the Hubby’s its life! The interior of the leather case is embedded with shards of glass, and the exterior is coated in road salt, dirt, and tire tracks – I’m going to keep it and try to clean it up though; together, they have quite the story to tell! I’m looking forward to 2014 and the promise it holds. I hope you have a very Happy New Year, too! Posted in About Moi | Comments Off on January, and all is… well, it’s January.